As two members of Northern England's early '90s free party scene, Laurence Ritchie as a founder member with the smokescreen sound system and Andy Riley who joined in 95 were firmly entrenched in the region's rich legacy of house music. After years of successful events, the free party scene began to come under increasing pressure because of greater numbers of government regulations such as the infamous Criminal Justice Act. After years of successful events, the free party scene began to come under increasing pressure because of greater numbers of government regulations such as the infamous Criminal Justice Act. The pair, already well known for their DJ'ing, decided to join forces and refocus their energy on producing original material. Five years after their first release, their partnership as Inland Knights has blossomed into an immensely successful career with prolific production credits and a demanding international touring schedule. The pair met in 1993 through their involvement with Northern England's early '90s free party scene,and the legendary UK free party crew-- Smokescreen Sound System .. The crew of eight in total threw free, large-scale events at various locations across the English countryside. Utilizing rotating, secret venues, Smokescreen attempted to keep their renegade parties as underground as possible to avoid detection by local police - a feat they managed to accomplish on a regular basis. They also organized more legitimate events, such as nights in local clubs, and eventually took Smokescreen on tour, traveling across the European continent. All Smokescreen events featured deep house, with occasional back room sets of down tempo jazz and funk. Working with Smokescreen piqued Laurence and Andy's interest in producing music of their own. Over the years Smokescreen fought hard to keep the anti-commercialism vibe of the free party scene alive, and still continue to this day to throw events purely for love of the music. During one especially successful period, the crew managed to throw a party every week for an entire year. 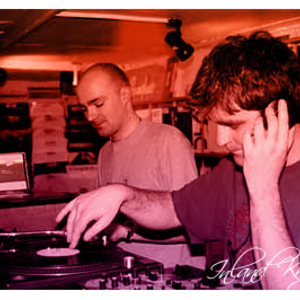 By 1998, Ritchie moved to Nottingham with what little studio kit he'd had in Sheffield, joined the To ka Project studio and began to put together the drop label whilst producing closely with Riley, who was already involved with To ka Project, his collaboration with Steve Walker and Jason Cowley..
Inland knights Volume 1 marked the launch of Drop Music; an independent outlet devoted to the production of quality house. The flourishing label has released material under various mediums, including EPs, singles and continuous-mix CDs. The Drop Music catalogue now has 32 releases to its credit, and is renowned in the dance music community for the quality and consistency of its work. Adopting various guises to showcase different aspects of their sound, including Party Criminals, In House Alterations, Grand Theft Audio and Big Audio Spidermite, Inland Knights have been responsible for most of the Drop catalogue. Their blend of jazz and funk, dynamic percussion and vocal hooks has been instrumental in catapulting the Inland Knights to international popularity. Their DJ sets are a fusion encompassing most styles of house, from dubby deep house, disco and garage to four-to-the-floor tech house. As enthusiastic about DJ'ing as studio production Ritchie and Riley have maintained a relentless international touring agenda since their collaboration began. Their schedule has included visits to Australia, New Zealand and South Africa, in addition to Singapore, Malaysia, Turkey, Chili,, the U.S.,and Russia as well as all over Europe. Their global jaunts have included stops at venues ranging from tiny hole-in-the-wall bars and nightclubs to world-famous, large-scale events including "Amnesia" in Ibiza; "Dance Valley" in Holland; "Fabric" and "The End" in London; and "Back 2 Basics" in Leeds. unnoticed by their fellow artists; their tracks have been licensed to notable compilations such as the "Global Underground" series and Miguel Migs' "Nite Life" mixes. The duo are rapidly becoming a very sought-after remix team. Some of their credits include Faithless' "Mohammed Ali," Onionz and Tony's "Everywhere You Are," Floris' "Shake It," and Dano's "Horny Hustle." "Creative Spaces," Inland Knights and Drop Music's highly anticipated first full-length album, was released in 2001 to widespread critical praise for its funky jams and deep, grooving melodies. For the CD version of the album, the pair opted to create a live mix rather than simply re-releasing the vinyl in another medium. Resisting the temptation to use a computer to digitally master their mix, they simply released a live mix with no editing. Towards the end of 2004 and into 2005 , Inland knights have been busy in the studio with notable remixes for the likes of Tango recordings, as well as remixes for up and coming label Blockhead records, and MobileTrax(a label run by smokescreen buddy Steve Lee of the Littlemen). Early 2005 will see the pair release a major compilation on N.R.K called 'Family Duals' which will showcase some of the Knights back-catalouge as well as licensing current tracks from the cream of the house community. As well as this project Inland Knights will be concentrating on new material for Drop with two new E.P's scheduled for the end of the year, as well as regular dj slots at the weekends. Despite their success as producers,and over seven years of releases under their belts, they refuse to withdraw into the studio and will continue to DJ and tour extensively. Riley notes they are always looking to balance their performance and production schedules. "If you start to do too much of one," he says, "You start to miss the other."